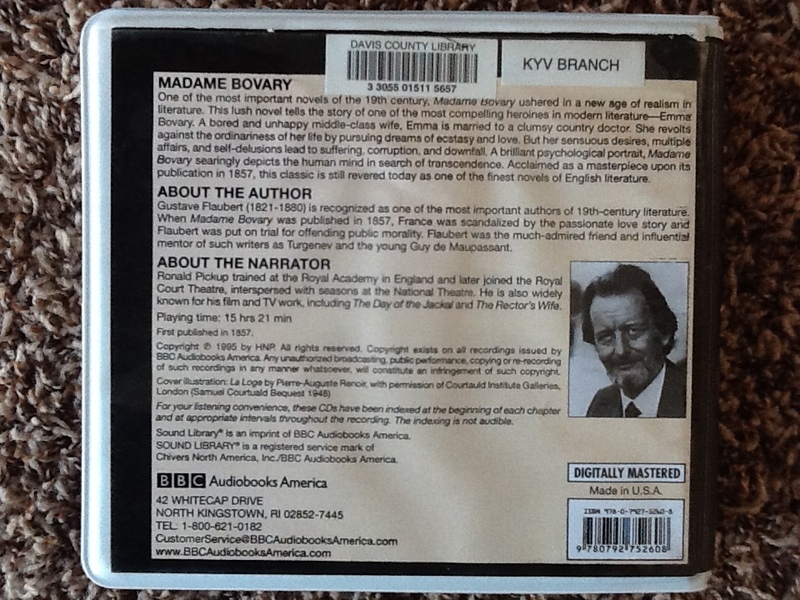 Dear Jane Letters, Carp Gasping for Air, and Amputations: Madame Bovary – The Bookshelf of Emily J.
I have been wanting to read Madame Bovary (1856) by Gustave Flaubert and number 85 on the BBC book list for quite some time. Years, even. I finally got to it by listening to it on audiobook while driving to school, and I am glad I did. I know it was scandalous in its time, because the plot centers around Emma’s adultery. Yet there is more than just adultery to be scandalized about in 19th century France. Innuendo played a large role in this novel, from the married Charles Bovary’s back brushing against the young and unmarried Emma’s breasts to her tongue innocently flicking in and out of her mouth while eating. I found those details to be more responsible for the scandalous nature of the book in its time rather than the plot. I think the public did, too. Flaubert was put on trial for obscenity and later acquitted. The plot centers around Emma Bovary, who marries the widowed doctor Charles Bovary but can never find it in herself to love him. He bothers her almost as soon as the marriage is made. Many married couples would complain of the same problems Emma notices. I think the difference is that Emma is in love with love and lust, rather than embracing the kind, patient, plodding kind of love that keeps couples together. She never works at loving Charles, but instead dismisses him and his peculiarities, immediately letting her eyes rove for other love. At first, this thinking of hers is innocent. She notices handsome men at a ball and about town. She notices, but never acts. And honestly, I felt sorry for her on some levels. I believe Flaubert may have wanted his readers to feel conflicted about judging Emma’s eventual actions. Charles is not an overly attentive husband, and I can understand and sympathize with her frustrations and her needy feelings. All of this leads perfectly into Rodolphe preying upon her. He can see that she is desperate for love and attention, so he plots to seduce her and be done. They end up having a lengthy love affair. They plan to run away together, but Rodolphe ditches Emma at the last minute, writing her an amazingly insincere Dear Jane letter, untrue phrases of which are still in use today. The letter is hilarious, and particularly slimy, as we know Rodolphe is a player. The version I listened to made this quality even more tangible. Rodolphe’s voice is perfectly creepy. In the Dear Jane letter, he claims that he loves Emma too much, that it isn’t her, but him, and that he will always think of her fondly. He even manufactures a tear on the page by spilling a drop of water for effect. It reveals what some men are capable of when it comes to a woman’s feelings. It also highlights how differently men and women sometimes view relationships. Women become emotionally attached and want everlasting love, while this man was only in it for the physical pleasure, and he leaves the moment his freedom is threatened. In this, I feel sorry for Emma, although she did get herself into the situation. She had no idea what she was dealing with, and he lied to her throughout their relationship. This quote sums up Emma’s part of it perfectly: “Poor little thing! She’s gasping for love like a carp on a kitchen table gasping for water” (Part III, Chapter VIII). There’s an interesting scene following Emma’s deep depression over Rodolphe’s having left her. It is one in which her doctor husband, Charles, performs a procedure to help a man walk, fails at it, and must consequently amputate the leg. Emma is at first proud of her husband and feels herself again drawn to him for attempting this new procedure and for being innovative and successful. When he fails and the amputation must take place, Emma again hates him. I see the amputation scene as a metaphor for their marriage, and for any bad marriage. Perhaps amputation (or divorce and separation) are best in some cases. Barbara Kingsolver, popular author of The Poisonwood Bible (1998) and The Bean Trees 1988) among other novels, uses the amputation metaphor in her essay on divorce called “Stone Soup” (which you can read here). As I listened to Madame Bovary, I wondered if Kingsolver had gotten her idea of using the amputation metaphor from this piece of literature. Kingsolver defends her own divorce and laments the fact that she feels so judged for doing so and the fact that so many of her friends are not the same. Here’s what she wrote that reminded me of the amputation scene from Madame Bovary. “Like a cancer diagnosis, a dying marriage is a thing to fight, to deny, and finally, when there’s no choice left, to dig in and survive. Casseroles would help. Likewise, I imagine it must be a painful reckoning in adolescence (or later on) to realize true love will never look like the soft-focus fragrance ads because Prince Charming (surprise!) is a princess. Or vice versa. Or has skin the color your parents didn’t want you messing with, except in the Crayola box. I highly recommend Kingsolver’s essay. It’s full of interesting thoughts and issues. I’m not sure that I agree with everything she says, having been part of a step-family as a child, but I do like her style. Before we get back to Emma and her plight, I must take a moment to say how disappointed I was with the description on the back cover of the audio book I listened to. Do you notice anything wrong with it? No? Yes? Maybe it is too hard to see. First, the publication date refers to its publication as one volume and ignores the 1856 serialization of the novel. Yet my biggest issue is that it calls Madame Bovary one of the finest novels of ENGLISH literature. Uh, it’s FRENCH! That’s a serious mistake, in my opinion, and I’m sure Flaubert would agree. It’s French literature, NOT English. Emma’s deceit does not stop after Rodolphe. She again engages in another affair, and rumors start to fly. Her husband never discovers it until she is dead, by her own hands. She kills herself with arsenic after finding that she is financially ruined. The morality part of this novel asserts that women who are unfaithful to their husbands and do not follow church teachings end up becoming the laughingstock of their communities and being bound by debt and financial problems. Spiritual and moral problems lead to financial and temporal problems. I can see that this sort of pattern could have been true in other times, but I think we live in a time now where our society is concerned with avoiding responsibility for our actions. I think it is possible now to delay the consequences or contain them. Now such behavior does not lead to financial ruin. Has that lack of complete ruin taught us that we are invincible? Has a lack of consequences, in anything, contributed to a society that is more interested in the individual than the community? Are there consequences for pretending that we can get away with anything and not have to worry about spiritual problems causing temporal ones? There’s another reading of this novel’s end. Why does a woman have to die when she asserts her sexuality? Her husband was a boring loser, she was young and pretty and deserved nice things. Why shouldn’t she seek for love and riches? Why does she have to die when she acts the same way men have been acting for centuries? I think an argument against this reading is the fact that Rodolphe was such a jerk. He plotted to have a one-night stand with her and when he couldn’t get rid of her, he played her and took her trust and crumpled up her hope and threw her away. There is a warning for women in this snake-like persona of Rodolphe, who just says the right things to get into Emma’s bed. He was disingenuous, and while Emma should have resisted or known better, she was tricked all the same. I see some clear imagery and parallels to one of the oldest stories we like to tell: that of Adam and Eve in the Garden of Eden. I am not sure which approach Flaubert intended to promote. Perhaps none of what I saw. But any way you look at it, Madame Bovary broaches the tough issues of life and explores human nature in the face of difficult situations. There is something to be learned from Emma’s behavior and downfall, just as there is instruction in how to be a better husband from Charles’s failures. There is a lesson to be learned about not trusting snake-like men. From the perspective of the pharmacist’s clerk, who ended up accidentally giving Emma the poison she used to kill herself, there’s a lesson in looking for warning signs of mental illness and preventing those we love from suicide. 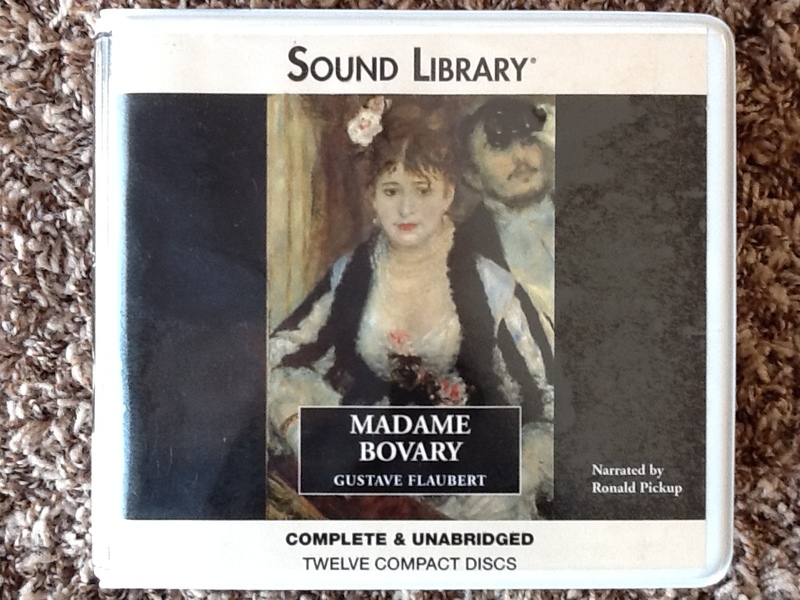 Have you read Madame Bovary? What lessons did you learn from it? Hey I remember reading and discussing Kingsolver in your class! Also, this novel sounds somewhat depressing and has a stream of lessons, so it is right up my alley to read. You know I am really grateful for all your book reviews and recommendations. At times I find myself wandering around a bookstore judging books by their covers. I was just thinking that many of the books you covered in your blog are books that I came across realizing that if I have not gained your feedback and insight on it, perhaps I would have never choose to give them a change to read now or put on my list for later. I realize I am guilty of “judging” a book by it’s cover and I miss out on some of the best novels of time! So thank you again. I love you and I love this blog! I read Emma Bovary well over 20 years ago. Loved this essay, thanks! I got myself a copy for Christmas last year (it was either this or Anna Karenina) and am planning on reading it this spring! I’ll revisit this post once I finish. It’s amazing to know that the issues and themes are still so relevant, even over 2 centuries later. (I hate that I’d once dated guys like Rodolphe!) Thank you, too, for the link to Kingsolver’s essay. It is so true that Rodolphe’s still abound. I hope you enjoy reading it! As you liked Madame Bovary, you should read Flaubert’s ‘Trois Contes’ as well when you get a chance – real gems! I’m not sure what the exact translation will be in English but it means Three Tales so it will be easy enough to find, I’m sure. Thanks for recommending Kingsolver’s essay – looks interesting! That sounds good. I will look for it. Flaubert was a fantastic writer. Thanks for reading! I am glad you are here and that you found the list! I think it might be folkloric in some senses, but I’m sticking with it. Thanks for reading. A great book b y an artist who worked hard at his craft. He once said “discipline makes art of impulse.”Something to think about! Ooh, that’s deep and so insightful. I like it. I appreciate your doing the hard work of interpretation and presentation. I have read this so long ago, that you told me more than I remember. It is nice to get the critique, as well! I am not sure I was in tune so much when I read it! Thanks! I always forget the details of books, which is why I love blogging so much because this helps me keep a record. And I’m sure if I had read this when I was younger I would not have gotten as much out of it. Maybe I’ll have to revisit it again in ten or so years and see what else I see! When you’re in a French Highschool you know that you will have to read this book, and you know that you will have to suffer Emma’s choices. Then when you start your literature programm, professors will go over the book again. This is the reason why most of the French students are tired with this book even though it is a masterpiece of realism, and Flaubert would say at the end of XIXth century: “I am Madame Bovary”, and everybody would interpret that the way they want because it was quite a revolutionary book when it was published. I love it, but I hate it in the same time because I had to study it in details since I was 16, and because everytime she makes a choice, it is the wrong one. I love hearing your perspective, and I can understand why you are tired of it! I think students of American literature are sick of Twain’s Adventures of Huckleberry Finn. I did enjoy it, and I now know why Flaubert is considered a master of realism. I’m going to read it soon, and I’m looking forward to it. It looks like we have that in common! I loved Anna Karenina, too. It is definitely long and dense, but those are sometimes the best novels! Before I forget, I must say I have never reads kingsolver but now I want to! I read Madame Bovary last year and while I liked it overall, I found some of the writing forced and heavy handed. Now that could have been the translation I was reading (shame on that audio book company for calling it English literature!) or Flaubert’s style. I have never read anything else by him. I did not find Emma to be as much of a sympathetic character as Anna in “Anna Karenina.” Emma is flighty and uncommitted to begin with. Anna has more depth and is a woman who truly unravels through misconceptions and the harshness of society’s judgment. Emma makes foolish decisions with her ridiculous spending and just felt like a floozy to me. I don’t know if that was Flaubert’s intent, if he was just painting how he thought women are, or if it was meant to show her youth and innocence. Now Anna is not innocent either. She also has a long drawn out affair, but I think what happened to her and her suicide is deeper than with Emma. Emma got herself into a horrible situation, but she could have swallowed her pride and told her husband the truth. He would have forgiven her, at least that is how Flaubert makes it sound to me. Anna’s situation was infinitely more complex to me. I could wax on about Anna. It is my favorite book of all time. I will admit, I scoffed at the idea of Keira Knightley playing her, but I just watched the new movie and she played Anna to a “T” in my opinion. Anyway, what they really have in common is that society places them, and therefore, women, in impossible situations. Divorce, even when possible, destroys women’s lives. If in the late 20th, or early 21st century Kingsolver had a problem, well, she is lucky in the scheme of history. While I think people should try to work on a marriage if there is still love, I am thankful that I live in a time and part of the world where divorce is not the life destroyer that it used to be, and that women have other options than scandal and suicide. Or murder. Great point about the historical and culturally situated aspects of divorce, especially at the time of this writing. I also love your thoughts on Anna Karenina. What a fantastic analysis and contribution to the discussion! As to Kingsolver, I like some of her work and other stuff I don’t. You might appreciate her. I think she has something to offer everybody in terms of content, but I don’t always like her style. Pingback: Sinclair Lewis’s Critique of American Culture: Main Street | The Bookshelf of Emily J.